Today's release of Review Board 3.0.14 fixes a handful of bugs that may be plaguing you, and introduces some long-overdue UI improvements for integrations and avatars. Review Board now displays a default avatar when no other avatar service is available for the user. This avoids those annoying blank avatars and ugly log messages when users have opted out of all other types of avatars. 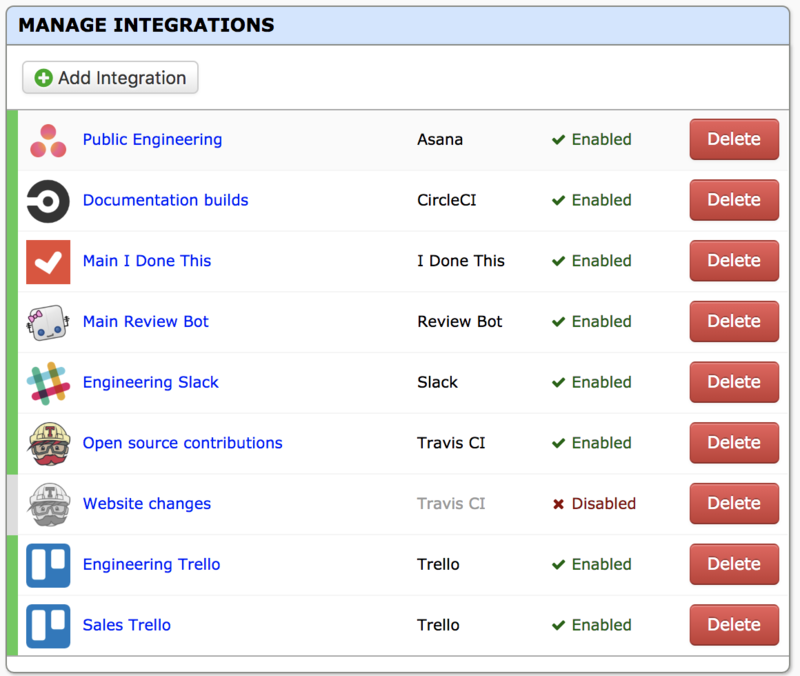 Integrations configuration has been completely redone, making it easier to see what integrations you already have and which are available to install. RBCommons will be receiving support for integrations very soon. We're beta-testing this now, so if you're interested in trying it out, let us know! A regression with using integrations bound to repositories and review groups has been fixed. The bubble shown on the Review Request page when there are updates doesn't sometimes list the wrong reviewer name anymore. Our close-on-push hooks for GitHub, Bitbucket, and other services no longer crash when encountering invalid review request IDs in commit messages. We've bumped up the version of Less, the language used for our CSS, from 2.6 to 3.9. Extensions can now make use of all the latest Less CSS features. The Users API now supports optional rendering of avatars, supporting all Review Board and in-house avatar services. See the release notes for all the changes in this release. Today's release is the second in a series of releases built to improve the speed of the product, reducing the database work required in most pages and in the API. That's not all, though. We've fixed a few bugs, including an API regression from 2.0.12, and added a few new user-facing and administrative features. We've further reduced the database work required by Review Board, particularly when it comes to loading and saving user-specific data, something we do on nearly every HTTP request. Behind the scenes, we've made several improvements to our API testing infrastructure that will help us make the API more lean in future releases. We've added a new menu to the top-right of Review Board that helps users find the Review Board News feed, Twitter, Facebook page, Subreddit, and YouTube channel. This is intended to help users follow the latest Review Board and RBTools updates and to read, watch, or discuss both code review tips and Review Board in general. If you're dealing with "this e-mail is suspicious" warnings in your e-mail client, you're running into problems with how Review Board sends e-mail on behalf of users. While this can generally be corrected through proper domain records, you can now change how Review Board generates e-mails through a new option in the E-Mail Settings page. We've fixed a regression in the review request draft API that caused unwanted groups to appear when emptying the field. Those using custom X.509-based authentication schemes can now specify a custom username field without forking any code. Search results now contain inactive users and closed review requests. Condition fields for integrations no longer show any archived/hidden repositories or hidden groups, resulting in less noise when setting things up on older installations. See the release notes for all the changes in 3.0.13. A handy new sidebar view catalogues all the changes made throughout the document, so there's no need to carefully scrutinize as you scroll. If you do need to scroll, a new "Lock scroll" checkbox gives you control over whether the documents should scroll in sync, or scroll individually. 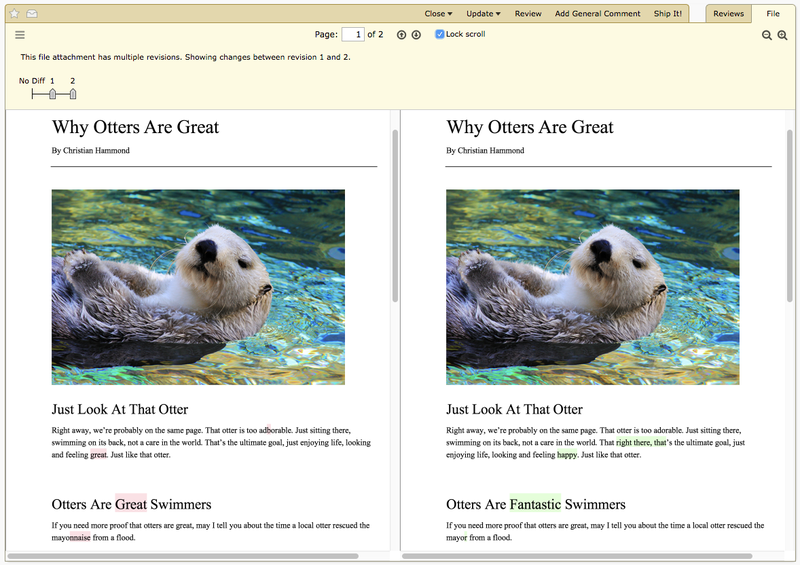 In order to enable diffing support for PDFs, you will need a PDF document that contains text information embedded in the document (such as when printing to PDF or using OCR on a scanned document). It's also important to update the existing PDF file attachment with the new document, instead of creating a brand new upload. We've revamped the Power Pack configuration page to better show the status and health of your license, how quickly the expiration date is coming up or whether you're hitting your user cap. The new "Manage your license" button takes you straight to our license portal where you can renew your license, convert to a yearly subscription, add additional users, and more. We've sorted out some crashes and visual glitches in reports, as well as a compatibility problem with AWS CodeCommit. The full list of changes are in the release notes. Today’s release of Review Board is the first in a series of releases focusing on performance. We’re going through the product with a fine-toothed comb, looking for places where we can make things faster so your servers can be happier and your developers more productive — or vice-versa. Review Board 3.0.12 reduces the amount of database work required when updating or publishing review request drafts, loading extensions, processing integrations, and working with the API in general. It also lays the groundwork for further improvements coming in 3.0.13 and beyond, helping ensure faster database reads and writes across the product. And don't worry — no database upgrades are required for this release. 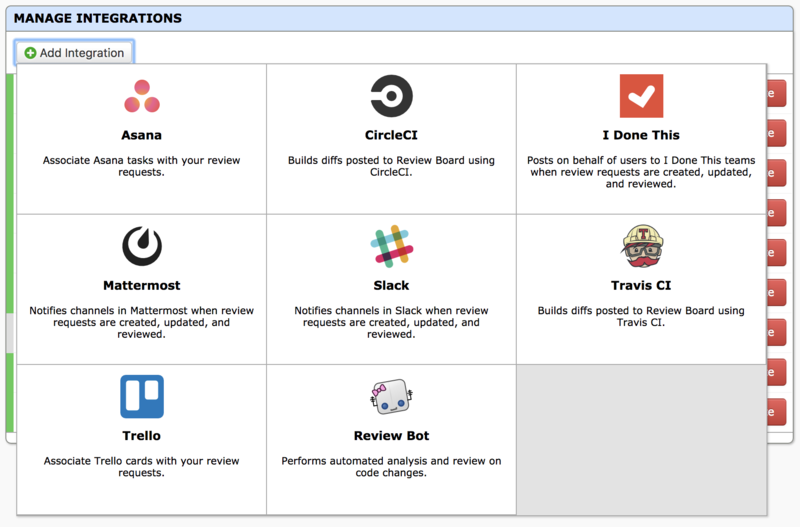 We've reworked two of the APIs to help customers building their Review Board integrations. The review request draft API now handles concurrent updates to the same draft from multiple clients far better than before, preventing fields from being overwritten unintentionally. The repository API has also been rewritten, making it easier to archive repositories, adding better validation, and getting things ready for creating and updating repositories backed by hosting services (coming soon). We've also fixed a crash that could occur when sorting non-sortable Dashboard columns in the URL, the length of archived repository names, and over-zealous access restrictions in the Diff Context API. See the release notes for more details on everything that's in 3.0.12. Today's release of Review Board 3.0.11 features a security fix in the API, compatibility with modern Bitbucket WebHooks, and other improvements. We've also put out an accompanying 2.5.18 security release, for those who haven't yet upgraded to 3.0. The Diff Validation API allowed for private repositories to be specified when validating a new diff. This did not leak any file contents whatsoever, but could expose whether a particular file at a revision did or did not exist, or whether an uploaded patch could be applied against those files. This is only an issue for servers making use of private repositories, and it does not apply to Local Site access control. Still, we recommend that everyone updates to this release. Bitbucket removed support for their legacy WebHooks, which broke Review Board's ability to auto-close review requests when commits are pushed. The 3.0.11 release adds compatibility with the newer WebHooks. Follow the instructions to re-add any hooks you had set before in Bitbucket. See the Review Board 3.0.11 and 2.5.18 release notes for the full list of changes. Although there are no known exploits found in the wild, we do recommend that everyone upgrades to this release. That's not all. Check out the release notes for the rest of the changes. Today's release of Review Board 3.0.9 brings on a handful of bug fixes for extensions, diffs, review requests, Perforce, Subversion, JIRA, Review Bot, and more. Plus, better active user tracking (for support contracts and licenses) and new condition rules. A recent release of Review Bot unveiled some bugs in our extension handling. When installing for the first time, Review Board could crash loading the metadata. Shouldn't be a problem anymore, and thanks everyone for your patience on this. We now store information on when users last used Review Board, helping administrators get a better idea of their active user base. Particularly helpful when signing up for support or purchasing a Power Pack license. Tracked down an odd bug with Perforce involving access-restricted Perforce clients named "none" blocking new review requests from being posted. If JIRA was configured wrong, your logs could be full of crash details when failing to access a ticket. Now we handle that much more gracefully. The Review Bot bug wasn't limited to just Review Bot. Any extensions with Unicode characters in the description could break, but not anymore. We've also identified an issue that could break some custom authentication backends, and another that could prevent custom date/time fields from saving reliably. We've fixed up some alignment annoyances with move detection flags in the diff viewer. Moved lines of code no longer appear ever-so-slightly indented. The Dashboard had some lingering hover styles for date fields that were pretty sloppy. We got rid of them. Notifications for updates on a review request could also show the wrong timestamp in cases, or the wrong user if an administrator changed a review request. Edge cases, but they're taken care of. We've added new options for choosing when Slack and other integrations do their thing. You can now define rules based on who has participated in discussions on a review request, or who is listed as a target reviewer. Fixes for the API, better safeguards for webhooks, and new helpful instructions for Beanstalk. Today's release of Review Bot, our automated code review extension for Review Board, introduces a few new features and fixes several compatibility issues and other bugs. Most of these wouldn't have happened without our wonderful community of contributors and early adopters. Thank you! Let's look at the highlights. Some tools (such as the Clang Static Analyzer) need a full checkout of the repository in order to perform a full review. These now work with Mercurial repositories in addition to Git. Cppcheck can now be forced to check source files as either C or C++ code. This is helpful for codebases that treat .h files as C++. By default, it will continue to auto-detect the file type based on the extension. Review Bot now authenticates properly with Review Board 3.0.8. Dependency conflicts involving pyflakes, pycodestyle, or flake8 when installing the Review Bot Worker have been resolved. Not everyone hit these, but it was common on newer installs due to changes in newer versions of these packages. We've smoothed out communication between the Review Bot extension and worker services, added better error handling when saving a configuration form without all required data, removed unwanted temporary files, and fixed error reporting in flake8 and cpplint. If you're continuing to hit problems on Windows, please let us know in our community support tracker so we can collect additional information on your setup. The big announcement today, though, is a new companion to Review Board that we'd like to introduce you to. RB Gateway is a microservice used by Review Board that's built to address shortcomings in Git and Mercurial's APIs. Git, in particular, is quite limited. It doesn't provide fine-grained access to the contents of repositories, meaning that tools like Review Board typically have to depend on specific hosting services (like GitHub Enterprise or GitLab) or hacks to work. When using RB Gateway, Review Board can access your self-hosted repositories in new ways, enabling users to browse for commits, close review requests when a commit is pushed, and more cleanly managing your repositories. It works just like other hosting services, but is simple to set up and configure on all major platforms. This means no more GitWeb, cgit, or hgweb hacks! Just install RB Gateway, point it to your repositories, and tell Review Board about them. You're done. RB Gateway can be installed on Linux, macOS, or Windows. Installation is easy, and we have instructions to help you get started. For the best experience, we recommend Review Board 3.0.8 with RB Gateway. Older 2.5.x and 3.0.x releases support it, but are limited in functionality and only support Git.